Help/Questions (Answered) > Does the hobby know which insulator Brooks made for England? Does the hobby know which insulator Brooks made for England? This 1911 says Mr. Brooks made blown glass insulators for use in England. Does anyone know the insulator mentioned in the article? It says few were used, so maybe it is lost to history? The main idea of the whole article is comparing glass to porcelain and stoneware. 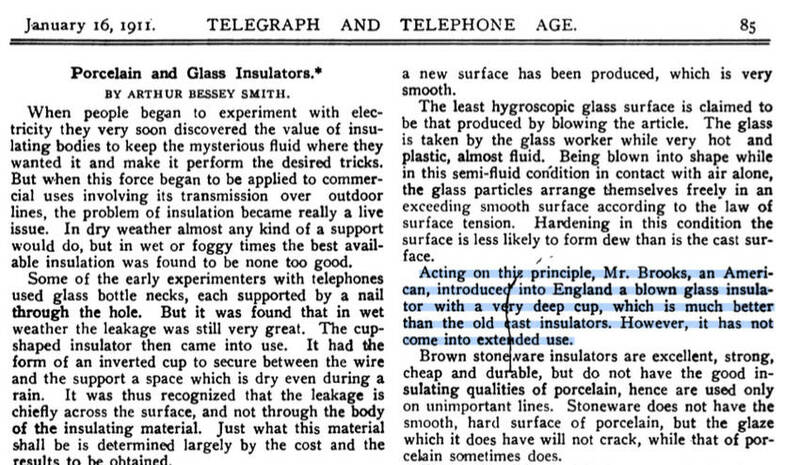 It says cast glass insulators were not sufficient for insulating needs in English weather conditions, but blown glass has better insulating qualities.